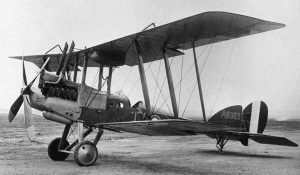 The Royal Aircraft Factory’s BE12 was an attempt to provide a more powerful single seat fighter version of the BE2c by fitting the Farnborough-based factory’s own 12-cylinder air-cooled power plant that would enter production as the RAF 4a. Despite the obvious outline differences between the new design and the earlier 2c its wartime career was one of mixed fortunes. Two subsequent variants were produced: the BE12a which featured the wings and tail design of the BE2e/f and the BE12b powered by the 200-hp Hispano Suiza. These aeroplanes offered little major advantages over each other but they did useful service as trainers and the 12b was employed as a night-fighter in the UK. In mid-1915 the BE12 was considered a good idea but by the time it entered service it was something of a compromise.